In order to establish a standard for social media measurement for destination marketing organizations (DMOs), six organizations joined together to focus on one clear goal: to create a framework to measure the financial value as a result of social media activities. The six DMOs that collaborated on this project are: Destination British Columbia, Illinois Office of Tourism, Innovation Norway, Tourism and Events Queensland, VisitEngland and Visit Flanders. 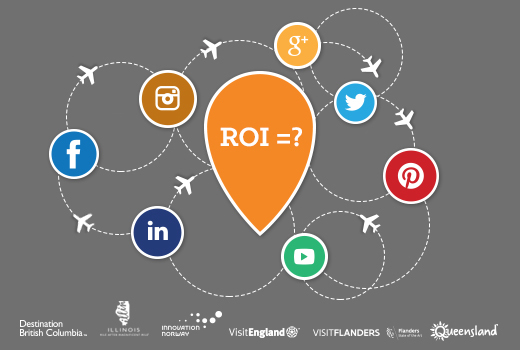 While social media has transformed destination marketing and DMOs have been using social media channels to promote their destinations for years, a consistent methodology to measure the impact of these marketing efforts is lacking. The intent of this project was to create an industry standard, using a framework based on the best-available data as a starting point from which to develop and improve. The framework is available for free so that any DMO can use it based on information and analytics it already has. This model contained within our white paper is intended as a tool for broad measurement and benchmarking. It represents a snapshot in time and should be viewed in that context. Given the changing nature of a DMO’s efforts, assumptions need to be made. The principles, however, are solid. We go beyond the measures already established that indicate efficiency, and instead focus on the effectiveness of social media marketing in order to also determine ROI. To receive the whitepaper, including more background, methodology, formulas and an easy-to-use calculator, visit https://destinationthink.com/poi/. So exciting! High five Team Destination Think! Thanks Vanessa! Happy to hear your feedback if your team applies the information! Hi Sandrine – Thanks! Unfortunately, the base report we used to calculate the channel impact values doesn’t include the Netherlands. But we do have the option to conduct research and establish them if there is enough interest to fund it! Are you saying that this figure ( 1,804 ) is for people who have been influenced by social media to come to this area and who otherwise would not have come to the area save for our stunning FB posts? I read the paper and to me putting it simply it reads that Facebook influences the travel decisions of 4.51% of the people who are engaged with that FB page – clicks, likes, comments share. “Actually reading the report closely that 4.51% is NOT the percentage of PEOPLE who are influenced. It is the percentage of the INFLUENCE within that pathway. ie Facebook accounts for 4.51% of the influence on people determining to travel to that destination, the other 95.49% comes from other pathways. It’s not about 4.5% of people being influenced by Facebook and the other 95.5 NOT being influenced, but rather the %age importance of Facebook as the influencer for people travelling to that destination. This is then multiplied up by the amount of engagement with that channel (the Mq in the post). Thanks so much for your comment and questions. The 4.51% is the average influence of a DMO’s Facebook channel in the path-to-purchase, based on the best data we have to calculate the value. That’s why we claim 4.51% of the economic value of a visitor (which, in this case, is $45.10 for each Mq). Hi Aurora, yes, the Phocuswright report, upon which a part of our model is based, just focuses on the four markets of UK, US, Germany and France, thereby excluding many destinations. However, it would be possible to conduct new research for those areas, should interest or funding allow for it. In the meantime, we hope it’s useful (even with US figures) in order to facilitate new conversations around potential impact. Hi Richard – thanks very much for the interest! It’s true that the analytics from channels like Instagram don’t report on unique users yet. That’s unfortunate, and hopefully we’ll have better data soon. That’s why we recommend at the moment to keep the reporting times smaller, in order to minimize the impact. Another way you could view it would be to make an assumption about “repeat engagement”. When it comes to the value of a channel, don’t forget that this is only the potential impact. It’s the demand created by Instagram, but that doesn’t mean it will all convert. Sounds like a plan, Richard. If your team applies it and has any feedback, please feel free to email me (mikala at destinationthink dot com). We’re particularly keen on hearing examples. 1. How do you accurately find the destination/brand’s Maximum qualifier? Is this supposed to be pulled from just 1 single social post? When trying to track the success of a social campaign, we have multiple posts, so I’m wondering if there’s concern over how to gather a truly accurate number that is counting only unique individuals rather than individuals who happen to like or engage with multiple pieces of content. The concern is if we count all the engagement across multiple posts, then we are likely counting individuals who have engaged more than once, but if we just pull the numbers from 1 post then it is likely too low since different posts reach different audiences. For instance, I’ve done both methods and the range varies from either $5.6 million to $15million POI based on whether we use the most successful post or an entire campaign to determine the Maximum qualifiers. How have you approached this issue with the 6 destinations who have tried this new POI formula? How are they accurately pinpointing their Maximum qualifiers? this is great work! Congratulations. Could it be applicable also for travel agency? I mean when we take as Cv the prize of one tour? And than when I am calculating POI for our SM campaign with the calculator, why the result is totally different number in comparison with manual calculation? But the calculator shows the number 56 705,27?